From itty bitty telescopes to the world's largest steerable telescope, Stars at Yerkes teacher leaders Sherry Shelley and Kathy Gustavson led participants on a journey of understanding radio astronomy at the November 2011 teacher workshop. Marconi, Hertz, and Bell were among the scientists highlighted in an opening discussion of the history of radio astronomy. Teachers were given the task to place names and events in a chronological sequence before the discussion, and were allowed to change their timelines during the session. Teachers discuss reconstructing the radio astronomy timeline. A message from aliens was deciphered next. S@Y teacher Marcella Linahan presented a list of binary code that provided participants the challenge of interpreting a message from outer space. The code was actually sent by scientists here on Earth to our cosmic neighbors into the void beyond. Linahan also described the work her students at Carmel High School contributed to the Pulsar Search Collaboratory. Students led by Sherry Shelley at Wilmington (IL) Middle School are also part of the pulsar project. Students analyzed data from the National Radio Astronomy Observatory (NRAO) in the search for these sources of radio light. Poster presentations were summarized and displayed. Marcella Linahan challenges John Sunta to decode an alien message. A major problem with studying radio waves from outer space is the constant interference blocking this light by everyday household devices. Sherry Shelley described how the NRAO is located in the only radio quiet zone in the world. To illustrate the effect of interference of the reception of radio waves, participants were guided through a series of centers where they tested the effect of devices on transistor radios. Participants rated the type and intensity of interference of radio waves from devices such as remote controls, computers, and walkie talkies. Teachers test the effect of a tv remote control on the reception of radio signals. Nicknamed the "itty bitty telescope," a television dish receiver was demonstrated by Kathy Gustavson as a way to further student knowledge about the uses of radio waves. Changes in pitch were noted as the transmitter-receiver detected the tree line surrounding the Yerkes south lawn. The featured speaker of the day was Dr. Rachel Rosen, astronomer at the National Radio Astronomy Observatory in Green Bank, West Virginia. Dr. Rosen discussed different sources of radio emissions in space, and how the evolution of stars and the interactions of binary star systems create fascinating phenomena to study. In her video teleconference, Dr. Rosen described how these rapidly spinning neutron stars are capable of rotating 700 times a second in extremely precise periods - amazing! Dr. Rachel Rosen of the NRAO shares her knowledge of pulsars and radio astronomy via teleconference. So how could you operate something like a microwave oven in a quiet zone, like at the NRAO? Put it in a Faraday cage! In the final session of the day, participants learned how a Faraday cage works and experimented with designs and materials for constructing their own Faraday cages. By using their cell phones and transistor radios, teachers were able to experience first hand the effect these materials have on the operation of these devices. We were reminded how a microwave oven uses the same principle to shield microwave light from escaping a household microwave oven. 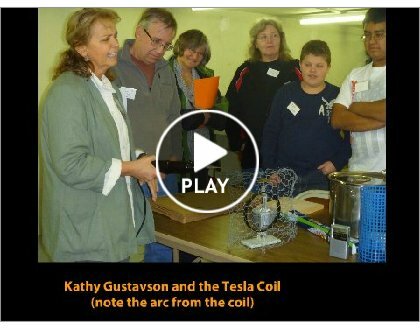 Sherry Shelly demonstrates the effect the aluminum mesh has on radio waves in her homemade Faraday cage. Now each time I pop my popcorn in my microwave, and see those "holes" in the oven's glass, I will think of that giant steerable telescope, the patrols to keep the quiet zone "quiet," and the mysteries of the stars beyond us whose secrets are waiting to be discovered. Click here to access more images from the day's events.